Issue #1 of TOOTH & CLAW, the exciting new series from bestselling writer Kurt Busiek (Marvels, Astro City), artist Benjamin Dewey (I Was the Cat, Tragedy series), Eisner-winning colorist Jordie Bellaire (THE MANHATTAN PROJECTS, PRETTY DEADLY), and letterer John Roshell of Comicraft has sold out completely at the distributor level. Fans in search of the highly anticipated, double-sized, 44-page, ad-less issue will be able to find TOOTH & CLAW #1 at participating Image Comics’ Headquarters retail locations. Find a store near you on the list below. Best described as Conan meets Kamandi with Game of Thrones-style storytelling, TOOTH AND CLAW #1 sets the scene for a richly layered fantasy story that readers will want to return to every month. In this first issue, a secret conclave of wizards brings a legendary champion forward through time from the forgotten past to save the world—with disastrous consequences. For digital readers, TOOTH & CLAW #1 is currently available digitally on the Image Comics website (imagecomics.com) and the official Image Comics iOS app, as well as on Comixology on the web (comixology.com), iOS, Android, and Google Play. 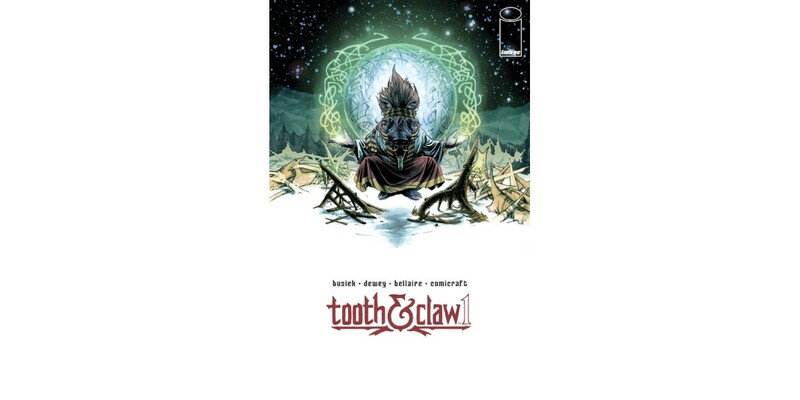 TOOTH AND CLAW #2 will be available on 12/3 and can be pre-ordered with Diamond Code OCT140609. A variant by Alex Ross will also be available to pre-order with Diamond Code OCT140610.